I have something really exciting to share today: my first print pattern and kit! Meet Harper the Owl. Here you can see the front and back of the pattern. 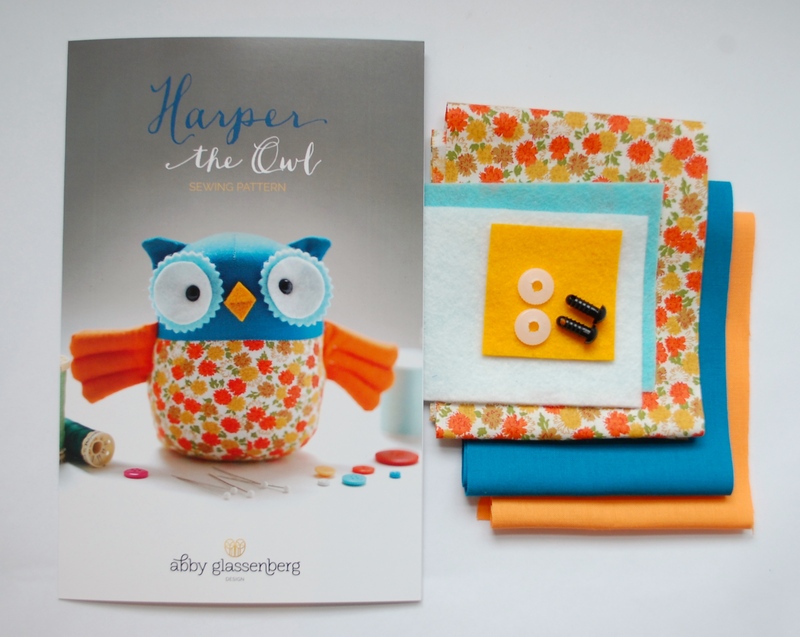 Harper is a really sweet little project that you can make from small cuts of quilting cotton and felt. 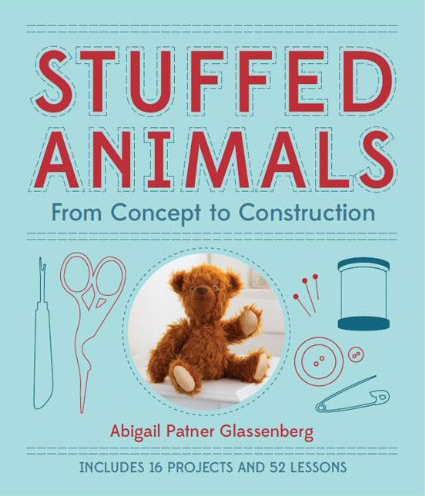 He works as a pin cushion or as a softie and comes together quickly by machine, but can also be hand sewn if you’d rather do some slower stitching. 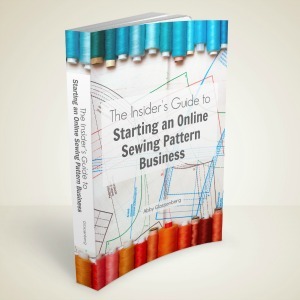 I began selling digital patterns right after turning in the manuscript for my second book in the spring of 2012 and I love selling PDFs. Digital patterns means no inventory to order and store and no labor involved to collate and ship. It’s mostly passive income and it works really well as a business model. Why do a print pattern? I think there are a few really convincing reasons. First, I love to teach and that’s where my formal training is. It’s tricky to figure out how to teach using a digital pattern, but with a print pattern I can easily put together a workshop and that’s really appealing to me. Second, print patterns can be kitted. I love kits. The first softies I sewed as an adult were from kits way back before I had this blog. Kits are a great way for new sewists to get started and they make a lovely gift, too. Again, gifting a digital product is tricky. Although I’ve had a desire to create print patterns, actually doing it always seemed complicated. Over the past few months I buckled down and figured it out. Today I thought I’d share how just in case you’re considering print patterns, too. The first thing I did was go to my local quilt shop and buy two patterns. I brought them home, took them out out of their bags and measured everything (including the bags!). Then I examined each part of them. I made of list of what information they included and noted down what I liked or didn’t like about them. I used this as a to-do list to start to prepare all of the pieces I’d need. Here were the hurdles that were preventing me from creating a print pattern. Once I identified them I could figure out a way to solve them. Graphic design – I’m not a graphic designer, but I wanted the pattern pages to look beautiful and to match my branding. I spent so many years fretting about this and letting it stand in my way. Finally this year I hired Lindsie Bergevin to create the pattern page layouts. Lindsie sews and she specializes in creating pattern layouts (one of her other clients is Liesl & Co). Materials – Fleece is the material I like to sew with most, but quilt shops don’t carry fleece. If I wanted my patterns to be carried by quilt shops I’d needed to sew them in quilting cottons. Instead of trying to remake my old patterns in quilting cottons which seemed sorta boring, I decided it would be more fun and interesting to design new ones. Harper is a new design and my Patchwork Elephant pattern, which has been selling really well and is also made with quilting cotton, will be my next print pattern. 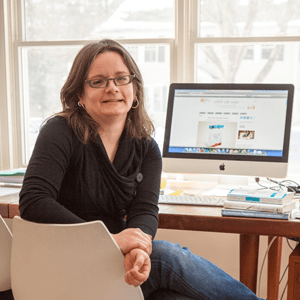 Distribution – I knew I wanted my pattern to be carried by the big distributors (Checker, Brewer, and United Notions) so that it would be in quilt shops nationwide, but I wasn’t sure how to go about it. It turns out you can just email them and…ask. It basically involves submitting the pattern for approval, filling out a form, and then sending in some copies for their sales reps.
Bar Code – I knew I’d need a bar code (many distributors won’t carry your pattern without one), but it seemed complex. I went onto the GS1 website and registered for the package that gives me up to 10 unique barcodes. It costs about $250 which seems a bit high, but I have what I need now for many patterns to come. They send you an image file of your unique bar code and you put it on the pattern. Done! Printing – Many indie pattern designers get their patterns printed either at Palmer Printers or Tri-State Printing. If they need tissue (which I don’t) then they use McCalls for that. 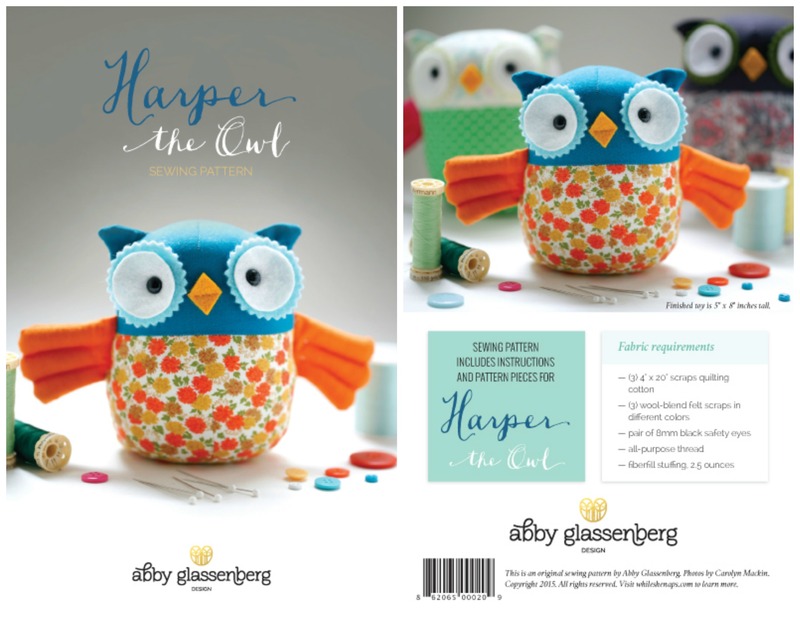 Harper the Owl is a small pattern and I envisioned it as a double-sided card. I was able to print it affordably as a folded postcard at Uprinting and they look great! Bags – I ordered hang bags from Uline and they fit the pattern perfectly. With the hole at the top they can be displayed on racks at the shops. Kits Supplies – My softies require small cuts of fabric. The minimum wholesale order for most fabric companies is 15 bolts and that’s way too much for me. I discovered New England Quilt Supply, a distributor 45 minutes from my house. I drove out there, registered for a wholesale account, and bought three bolts by two different manufacturers. Perfect. I sourced the felt from National Nonwovens. I actually have a third reason for wanting to do print patterns. There’s teaching and kits, but there’s also just the experience that comes with going through this process. If you know me you know that I’m fascinated with the business of craft. I want to look into every corner and see how it all works and my business gives me the opportunity to do that. All of this is to say that print patterns of Harper the Owl are now in my shop. They’re the same price as a PDF pattern and shipping is free! 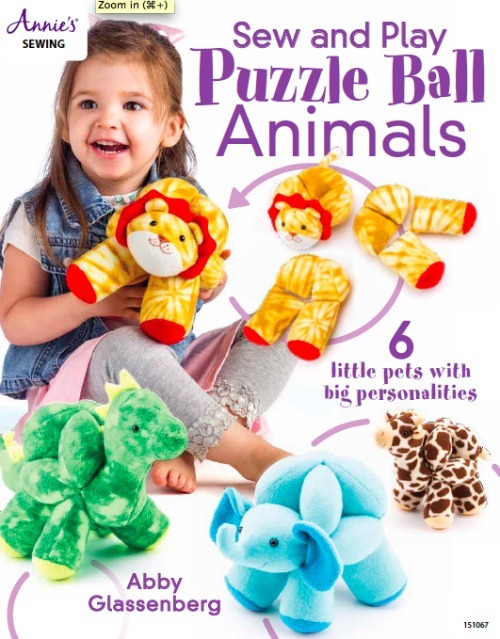 Kits include all of the felt, fabric, and eyes you’ll need to make Harper plus the pattern in one convenient and giftable package. Get them here. Thank you so much and I hope you enjoy making Harper. If you have any questions about print patterns or tips to share about the process of producing and distributing them, please chime in! Great article; great website! I just found you about 4 weeks ago. How do you go about getting a wholesale account? This is one of the things holding me back in my business due to now knowing how to achieve it. I’m assuming you live in the U.S.? You just need an EIN number. You then register with each business so when I went to New England Quilt Supply I just brought my Massachusetts tax form and my EIN and they set it up in a few minutes. I hope that helps! Thanks so much! Yes, I am in Virginia. I have an EIN number. Had no idea it was that simple. So kind of you to respond. Often times a quick phone call is a good way to find out how things work. If you want to buy supplies wholesale, call the supplier and ask how to go about setting up a wholesale account. That’s a totally acceptable question! Looks so great Abby! I am drawn to selling kits too, I LOVE KITS. I’ve never taken a project-based class before but they seem to be popular – if/when you teach one, I’d love to read a post about it. Maybe I’m over thinking it, though! They’re perfect for teaching kids or for a more casual workshop like at the sewing center near my house. A project you can do in an hour or two while chatting and having an evening out with friends. This is great and I love how you outlined the steps for other potential designers as well. Ah, that doesn’t bother me that much. Lots of quilt patterns are designed by people at home with the tools they have on hand. Often that’s Microsoft Word and although Comic Sans is a pretty terrible font to use for a professional pattern, if the pattern itself is interesting and works well I’m pretty happy to forgive. Abby, ever since you originally posted about this little owl, I’ve been anxiously awaiting its arrival. Woo-hoo! I enjoyed reading the more technical aspects of pattern creation. I had no idea so much went into making a pattern. Thanks for taking the time to post that information. As soon as I send this, I’m going to your shop. I see an owl pattern in my near future. Have a lovely weekend! Thank you so much for your enthusiasm! I love how you shared the process of developing your kits–so helpful to others! You just answered all of the questions I had about printing patterns in one blog post – as always thank you for the fantastic information Abby! Enjoyed the newsletter this week as well, so much great information. The owl is extremely cute. How easy or difficult was it to select the fabric colors and patterns for your kit? Would you eventually do different combinations, with a choice of colors, or have just one color option at any given time but it will change going forward or stick with this color combination? I can see the photo is with the fabric included in the kit, which might be a reason to stay with the same fabrics. I’m just curious about the behind-the-scenes process. Thanks for sharing! That’s a great question! The one mistake I made this time was using a vintage print for the floral portion of the owl. I only had a very small amount left and there wasn’t a way to source more. Instead I purchased a bolt of similar fabric that is really beautiful and that is what I’m selling in the kit. I need to take some new photos! Different color choices and combinations could be neat for the future, or for workshops. Thank you so much, Abby! I will be teaching some in person knitting classes next year. 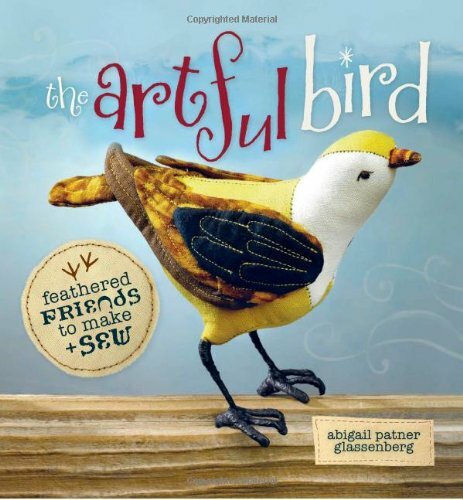 I wondered how to incorporate my own printed patterns and possibly knitting kits for students. I’ve printed some patterns at the Fed-EX store and they cost over $6 per piece to do, so it was kind of expensive. I’ll have to look into your recommendations. And YES printed stuff is AWESOME!!! I love the convenience of buying and selling PDFs but there’s nothing like a printed pattern or book. I agree and it’s really not that costly to design a real print a pattern. If you go through the process just for the few patterns you regularly teach and then also have those distributed wholesale and sell them on your website it very well may be worth doing. This post has been most helpful. I am going to order your ebook so I can get some more ideas about starting to sell my patterns as e patterns. I also learned a good deal going to Lindsie’s website. I look forward to pursuing my dream with more gusto.